James Gillray (1757-1815) was the originator of the modern political cartoon. He lived above the print shop in London that distributed his work. He favoured social and ideological comment; specialising in mixing the grand with the gross. Here, he is referring to the fact that the gout was supposed to be an affliction of the rich, who overindulged in food and drink (it is not). 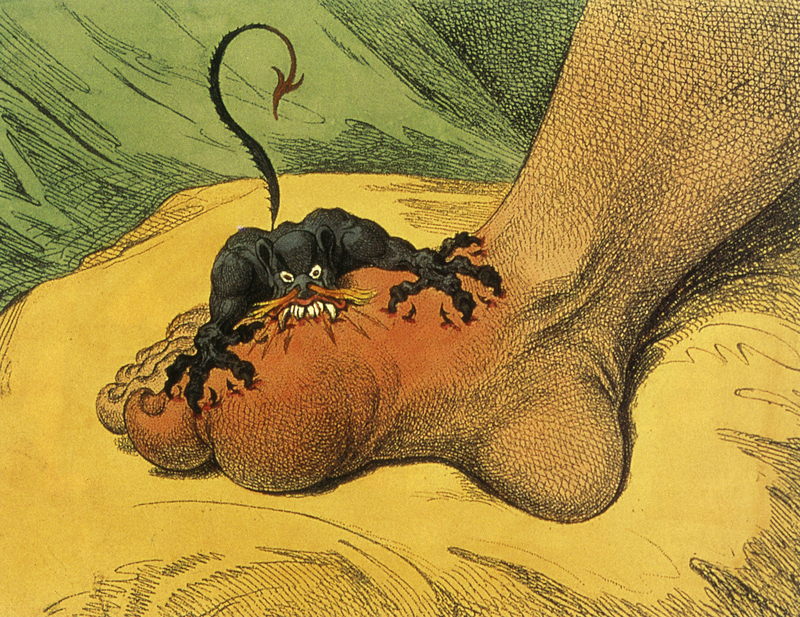 Robert E. Greenspan, “‘The Pain of Gout’ (1799) by James Gillray, reproduced from Medicine: Perspectives in History and Art. ,” ourheritage.ac.nz | OUR Heritage, accessed April 22, 2019, http://otago.ourheritage.ac.nz/items/show/11084.